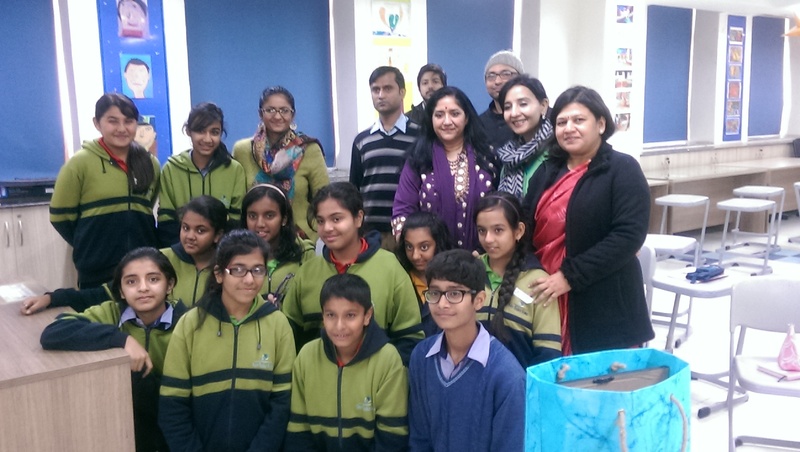 Our December Art1mpressions series paved the way for teachers, students and guests at Shiv Nadar School, Noida to give an audience to well-known art educator, writer and curator Roobina Karode. 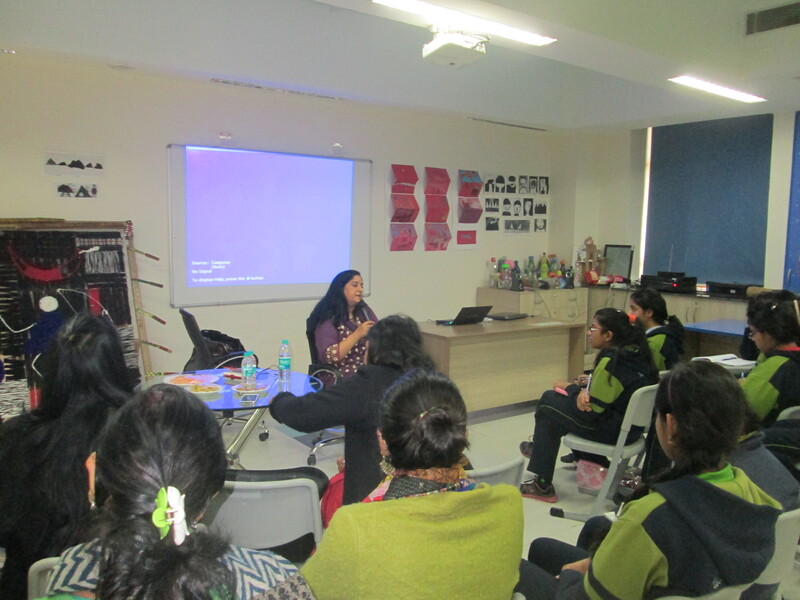 Our guest speaker spoke at length mapping out the individual journey of artist Nasreen Mohamedi. Karode brought into focus the manner in which Nasreen Mohamedi as a woman artist, active in India in the 1960s through the 1980s, embraced abstraction while the mainstream discourse was largely about the figurative-narrative tradition. She set the tone of the talk by illuminating on the phases in the artist’s life juxtaposed with her art practice and intercutting it with the exhibition she curated at KNMA. Karode who shared a personal equation with artist Nasreen Mohamedi, as her student and neighbour, spoke about her memories of Nasreen as a teacher. 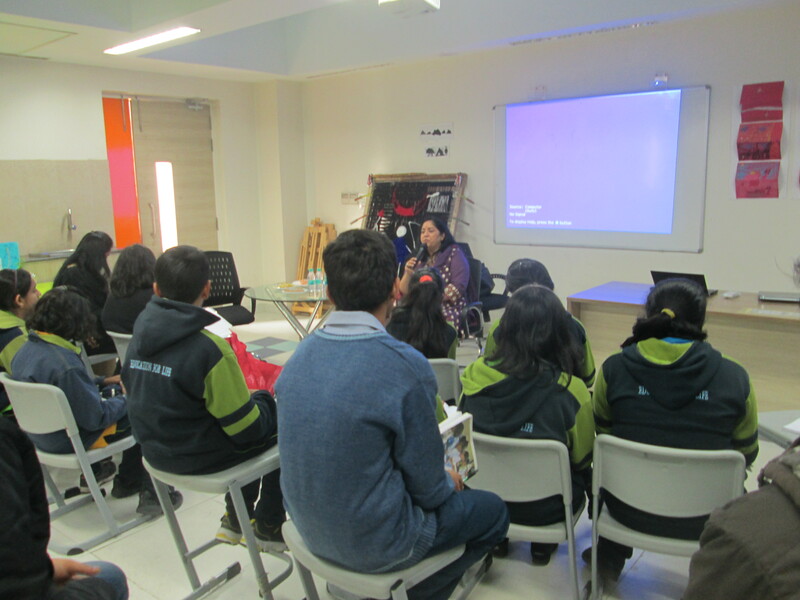 She spoke about her first day in class at M.S University of Baroda where the students were made to clean the surroundings outside the classroom making the paths bereft of any litter. As a keen observer, critic and curator of her works, Karode believes that Nasreen’s paths were always very ‘clean’. She cleaned everything that was unnecessary and extraneous to make way for purity of vision, which spilled into her works. She put to perspective the artist’s role in her life as a teacher who spanned out the learning and teachings of life and art through her novel take on the banal. Karode cited an instance when Nasreen Mohamedi called the students hurriedly from the class into the passage to witness the turning of the wheel of the automobiles. She wanted them to observe the manner in which form renders change when in speed. The knowledge she imparted through her incomparable ideas left an indelible impression on her students. Speaking of her as an artist in her own right, Karode talked about how she abandons colour, figure, portrait, story and finally hearkens a black and white phase in her work. While explaining her works with extreme detailing of the line, she talked of an incident when Nasreen Mohamedi plucked a strand of her hair and asked her students to make their lines as thin as the hair. Her eyes would always trap the unambiguous; this Roobina Karode explained while talking of her photographs especially the ones taken at Fatehpur Sikri, which captured not the Islamic architectural details but the lines and its pattern on the ground. Her interest was not in Islam or the magnanimity of the monument but she was pulled towards abstracting and abstractions. Setting the context of the journey of the artist, which was interspersed with struggles of myriad nature and with the kind of discipline and self-rigour practiced, Karode left the audience spellbound, opening a window into the world of an artist of the stature of Nasreen Mohamedi. In her concluding stance, she brought out the artist’s global appeal and acclaim in the way of her works which are being exhibited all over the world.